IntelliSkin™ is patent pending technology that stimulates thousands of nerve endings in your skin, which react instantly to specific light tough and pressure and causes an instant muscle reflex-like response that tones and strengthens under-used posture muscles. This technology cues your body to open and lengthen over-used, under stretched muscles which cause poor posture (rounded shoulders and forward head). The PostureCue Technology enhances basic compression to create the industry's first smart apparel. From the moment you put on IntelliSkin™, your posture improves because your body is aligned. IntelliSkin™ Cues your body to instantly tone and strengthen your underused posture muscles while simultaneously opening, relaxing and legnthening your overused and overly tight muscles. Whose is a canidate for IntelliSkin™? Everyone can benefit from good posture. Everyone can benefit from wearing IntelliSkin™. Whether you are an athlete, weekend warrior, a busy mom or work at a desk all day long, IntelliSkin™ is for you. Better posture means less back and neck pain, fewer injuries, deeper breathing and more energy throughout the day. When can I wear IntelliSkin™? Anytime! Wear it when you are working out, recovering from a workout, traveling or preforming any activity of daily life. How long should I wear IntelliSkin™? Wear it as long as you feel comfortable. When you start feeling fatigued, take it off and wear it a bit longer next time. There are different versions of IntelliSkin™ which allow you to wear it throughout the day, or wear one for shorter, more fatiguing bursts. 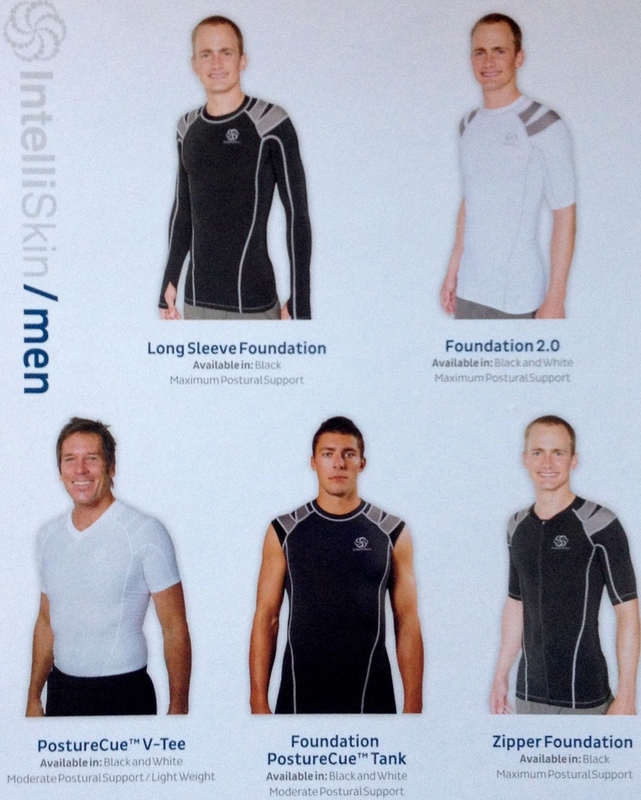 Here is the different selection of IntelliSkin™ apparel for both men and women. For more details and to check out athletes who wear IntelliSkin™, please visit IntelliSkin™.